Do you ever find yourself feeling disappointed that the important people in your life don’t take much interest in your business? Maybe when you started out you thought your friends and family would be great supporters and maybe even clients. A few months or even a few years into your business you’ve probably found that is rarely the case. 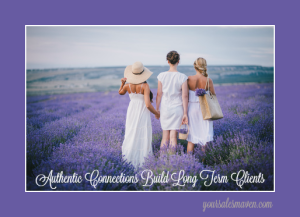 It’s so common for clients to share with me the feelings of disappointment in the lack of interest they’ve received by their friends and family in supporting them growing their businesses. Of course, when you’re starting out it feels safer to reach out to the people you know. The downside is, not many of these people will turn into paying clients for you. And many people get discouraged at this point. They start to question whether or not they should even spend their time and effort to grow their businesses. Here’s the harsh truth, if all of your paying clients are friends and family members, you more than likely have a hobby, not a business. Your business should be attracting clients with whom you don’t already have a personal relationship. Instead of spending your time trying to convince your friends and family to support you, go out and build a community. There’s a reason there are so many amazing networking groups out there. They provide a safe place to build new relationships, find potential new clients and build your tribe of supporters. Building my community outside of friends and family has been the most important thing I’ve done for my business. Without this community, there is no way I’d be where I am today with a thriving business. Your Savvy Sales Tip this week: Spend time building a community of supporters. Regardless of which group(s) you choose, take the time to get to know the other members. You just may find your next business partner, client, or opportunity is waiting there for you.